Choosing the right indoor water fountain for your home can sometimes be a very difficult task. After all, there are so many wonderful designs to choose from, it’s easy to forget the space restrictions that may be involved or that, while beautiful, certain styles may not fit in with your current decor. However, this article is going to point out some of the potential obstacles that you may face, so that you have them in mind when selecting the dream location for your new fountain. With a bit of thought, you can come up with the perfect place for your new fountain, and the style that best compliments its surroundings. 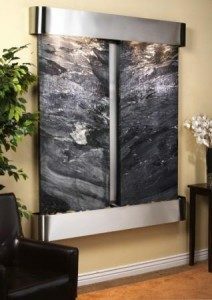 If you are considering an indoor fountain for decorating a room with limited floor space, you will want to keep that in mind when you are shopping for a water fountain. A small room with a big bed, for example, may not leave much room for a floor fountain. You certainly wouldn’t want it to impede a high traffic area, or become a tripping hazard. Your new water feature should be a source of tranquility, not a source of frustration because you can’t get around it. Only you can determine if you have enough floor space for the fountain, be sure to make a note of the dimensions and compare them to the space you have available. Keep in mind that floor fountains come in many different shapes and sizes, ranging from medium to very large. You should have no problem finding the right size floor fountain for your needs but may also want to look into a wall fountain or even perhaps a tabletop fountain. Also keep in mind that wherever you place your new fountain, you will need a nearby electrical outlet to plug it into. You may even want to place the fountain in a way that hides the outlet an power cord. For wall fountains that may require adding a new outlet in the wall behind where the new fountain will be. On the other hand, if you are looking for an indoor fountain for a larger room, like a living room, family room or even a den, you will have very few limitations. 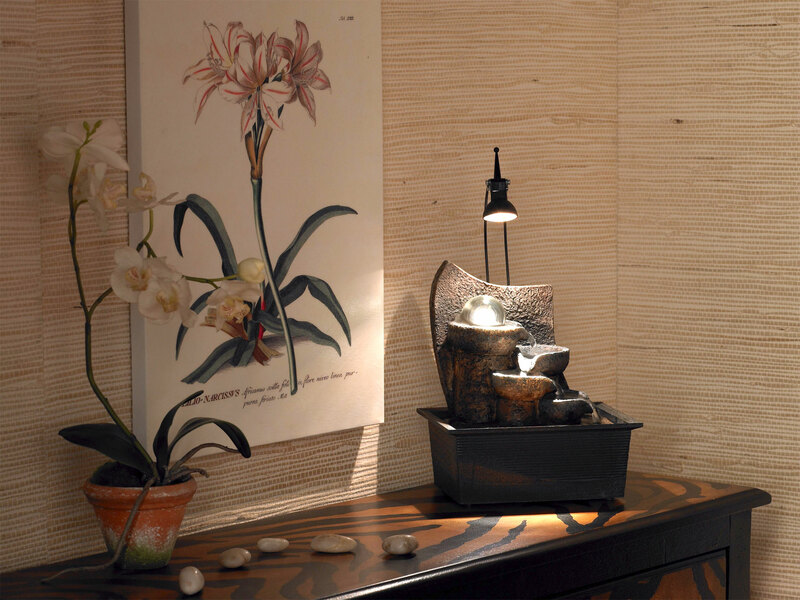 Wall fountains can go into just about any room and look great. There are countless styles to choose from. They do not require any floor space, but do, of course, require free wall space. They can be as small as a picture frame, or as large as an entire wall. They can even be mounted inside of the wall for an even more impressive look. Floor fountains can also be placed against a wall, which would require wall and floor space. In some rooms this may not be a problem at all, it may even be preferred, but it is something that you need to keep in mind when shopping. Of course, due to their freestanding nature; floor fountains can be placed anywhere in the room, even as the center focal point. Some of the waterwalls are even large enough to use as a room divider. Tabletop fountains can pretty much go wherever there is a flat surface available: Tables, desktops, shelves, nightstand, etc…, and they are extremely mobile so that you can move them on a whim. There is even a size range that lies in the grey area between tabletop fountains and floor fountains that work equally well on a large table or on the floor. With a beautiful decorative fountain, you can greatly improve the overall look of a room quite easily. The goal when selecting the best location and fountain type should be a seamless transition from the surroundings to the fountain. You do not want your indoor fountain to look out of place and rather odd in the midst of everything else. Choose the style and type that goes best with your current décor.